Because Short Rotation Coppices (SRC) for legal reasons are only allowed to be planted on agricultural land, they are often the attraction for several animal species. Compared to other agricultural crops, SRC are less domesticated and have a higher ecological value because they are not annually managed, they are significantly less fertilized or sprayed, the field is not ploughed every year and SRC accept herbal cover. Thus, SRC often provide much better habitat quality for wild species and erosion control than common agriculture. However, as the cultivation of SRC is also aimed at producing economic benefits, the spread of weeds, fungi, beetles and other animals must be kept under control. For the SRC of D4EU it is good news, that damages from red deer, insects or fungi are on a low level. However, the maintenance and ongoing repair of by now more than 40 km fences is an operational and time demanding challenge. 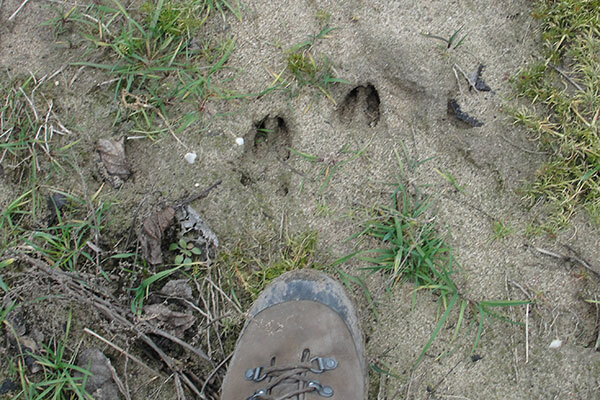 The picture shows the animal tracks of a roe deer (Capreolus capreolus), which has found its way through our SRC. Roe deer love to eat herbs, grass, leaves, shoots and buds. And it eats approximately 4 kilograms of that each day, which can cause serious damages. So, it is much easier to find their traces than the deer itself, because deer has an excellent olfactory sense. It can smell you even when you are more than 300 meters away.